Dentures are a wonderful invention and one that has been perfected over generations until we’ve gotten to the incredible prosthetic teeth we have today. Caring for dentures properly has always been a concern, though. While modern dentures aren’t much more difficult to take care of than your natural teeth, it pays to show a little vigilance in your maintenance of them to ensure they last you a lifetime. Dr. David Pendleton at the Rockdale Smile Center has been fitting patients with dentures and teaching them to take proper care of them as a central part of his career. If you’ve got, or are going to get, dentures then you’ll want to pay heed to these simple tips. So you’ve got this incredible new pair of dentures and you’re ready to dig into your favorite meals without pain or discomfort again. Congratulations! There’s little that’s as elating as knowing that your dining choices aren’t going to be limited by what you’re able to gum down. Just remember to take the following steps to ensure that your dentures last you for years to come. Remove your dentures and give them a rinse after meals – The ability to remove your teeth and ensure that they get a thorough cleaning is one of the decided benefits of having dentures. Dentists suggest that you take advantage of this by removing them after every meal and rinsing food and debris from them. Be sure to lay down a towel so they don’t break if you drop them! While you’re at it, clean your mouth – Since you’ve already got the dentures out to clean them, take a moment to clean off your gums using a soft-bristled toothbrush. Take care of your cheeks, roof of your mouth, and tongue while you’re in there as well! If you’re using adhesive, be sure to get the last of it off as well. Brush your dentures – Just like your teeth your dentures need regular brushing, of course, it’s a lot easier to make sure you’ve gotten all the nooks and crannies when you can just take them out of your mouth. 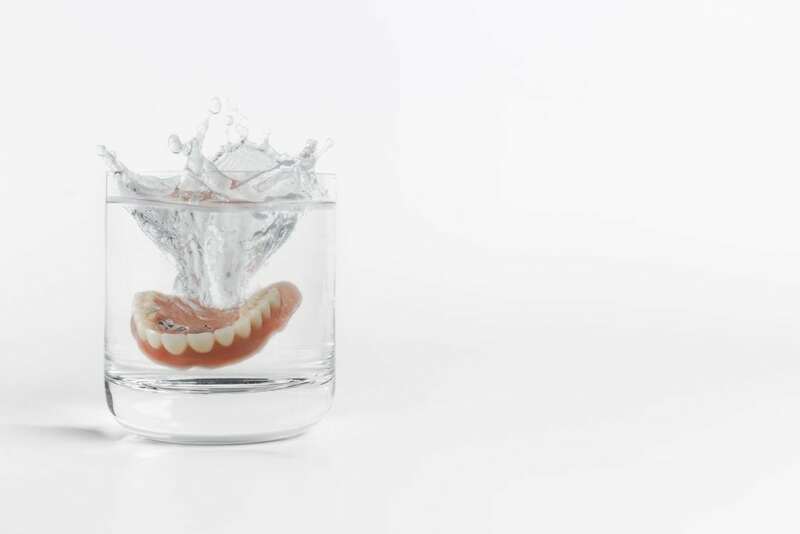 Soak Them Nightly – The majority of dentures need to remain moist in order to retain their shape, so don’t leave them sitting on the counter overnight. Instead, put them in a solution for soaking dentures each night so they retain their shape. These tips will aid you in making your dentures last the rest of your days, so it’s important to follow them. For additional guidance on the proper care and maintenance of your dentures, contact your dentist or Dr. Pendleton at the Rockdale Smile Center. Every year he helps hundreds of patients get new prosthetic teeth that enable them to enjoy the delicious things that life has to offer while bringing the world a beautiful new smile. Isn’t it time you got your smile back and were able to enjoy all your favorite foods again? Call and schedule a consultation today!